Ascension continues to expand its telehealth services, evidenced by its appointment of Kristi Henderson as vice president of patient access and care delivery transformation at Ascension Healthcare. Henderson was previously vice president of virtual care and innovation of Ascension Texas, where she helped build GoodHealth Solutions Center and GoodHealth Digital Clinic in Austin to provide integrated services for providers and patients through a centrally staffed resource center. She is tasked with establishing a national framework for remote care coordination, central referral resources, transfer management, remote patient monitoring, call center services and appointment scheduling, and overall patient customer service. "This approach would take a 360-degree view of the patient to anticipate their needs and would be deployed offering scale and standardization for a patient experience that underscores our Ascension brand promise of compassionate, personalized care for all," said Karen Springer, president of healthcare operations for Ascension Healthcare, who took over that role on Jan. 1. Ascension has implemented two telemedicine-equipped kidney transplant satellite outreach clinics in its Indiana market, aiming to make it easier for patients to speak with their transplant surgeons, specialists and social workers for pre-surgical testing and evaluations. The health system has also used virtual care in rural communities that have difficulty recruiting physicians. Ascension uses virtual care to leverage specialists in its more metropolitan communities to provide consultative support into its primary-care clinics, allowing care to remain local but still providing a high level of access to specialty medicine, Ascension officials previously told Modern Healthcare. "As the healthcare environment rapidly evolves to a more consumer-centric approach, Ascension's ability to create a seamless end-to-end experience for those we serve—including improved patient access and navigation, customer service and care coordination—will be vital to our continued success in achieving our mission," Springer said in a statement. More providers are employing virtual care as they explore ways to offer care through more affordable settings, increase access and prevent more complex ailments. But a broad push to adopt telehealth technology has stoked quality concerns. Some consumers and physicians argue that care quality inevitably drops without face-to-face interaction. Providers are also deterred by uncertain return on investment and limited broadband access in rural areas. Ascension and Providence St. Joseph Health are in talks to merge, which would create the nation's largest hospital system, according to a Wall Street Journal report Dec. 10. Ascension has not confirmed the report. In August, Ascension announced a proposed merger with Presence Health and its 10 hospitals in Illinois. 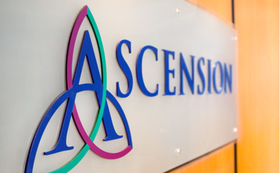 Ascension reported net income of $413 million on total operating revenue of $5.55 billion in the quarter ended Sept. 30, down from net income of $472 million and revenue of $5.66 billion in the same quarter last year. Its operating margin through November 2017 was 1.6%, down from 3.7% during the same period in 2016, the company reported at the J.P. Morgan Healthcare Conference in January. Ascension identified $312 million it could save in nonclinical costs, $200 million of which will happen in fiscal 2018, and $112 million over the next two years. It plans to eliminate redundant work and consolidate services like human resources and finance across the enterprise, among other strategies, executives said at the conference.